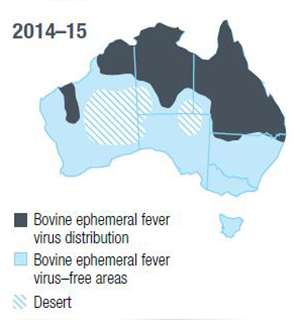 Ephemerovirus that causes bovine ephemeral fever (BEF) or three-day sickness in cattle and water buffalo. Arboviruses are spread by Culicoides midges and the distribution of these insects varies seasonally. In the Northern Territory BTV activity occurs in the north while the south remains free. The boundary between these zones—the surveillance zone runs across the south-western Katherine region, south-eastern Tennant Creek region and northern Alice Springs region. Why are sheep prohibited in the NT? The presence of bluetongue virus is the reason why sheep are not permitted in the Territory. Specific legislative requirements for the entry and keeping of sheep were introduced to protect the markets for the Australian livestock industries. Infection of cattle with BTV has never caused clinical disease in Australia, though sheep are susceptible to BTV and can develop severe illness. There is a high risk of sheep showing clinical signs, and there could be a serious negative impact to NT and Australian exports of cattle and sheep if a single clinical case of BTV was detected in Australia. Several strains of bluetongue virus have been identified in Northern Territory since the 1970s but have not produced clinical disease in cattle. In 2015, two new strains of BTV not previously reported in Australia; BTV-5 and BTV-12 were detected with no signs of clinical disease. This was reported internationally with limited impact on markets. BEF and Akabane are both endemic in northern NT and can cause seasonal illness and production losses in cattle, particularly when cattle are infected in southern areas. What is NAMP used for? To support trade: NAMP information is used during export protocol negotiations and to assist exporters in meeting export certification requirements. To provide an early warning to producers: surveillance detects new incursions and warns producers of arboviral spread into new areas where cattle not previously exposed may suffer severe symptoms. To manage risk: exporters can identify areas free from arbovirus activity to source live export cattle for arbovirus sensitive markets. Damara sheep, a breed native to South Africa, have been shown to be resistant to clinical bluetongue disease. All other sheep breeds may be susceptible to developing clinical disease. The Chief Inspector of Livestock may issue permits to bring sheep into the NT from other states. Damara breed will be favoured due to their resistance to bluetongue disease. Other breeds of sheep for slaughter may be given permission to be imported during the dry season when Culicoides midges are less active. Further information on NAMP is available from the Animal Health Australia website.